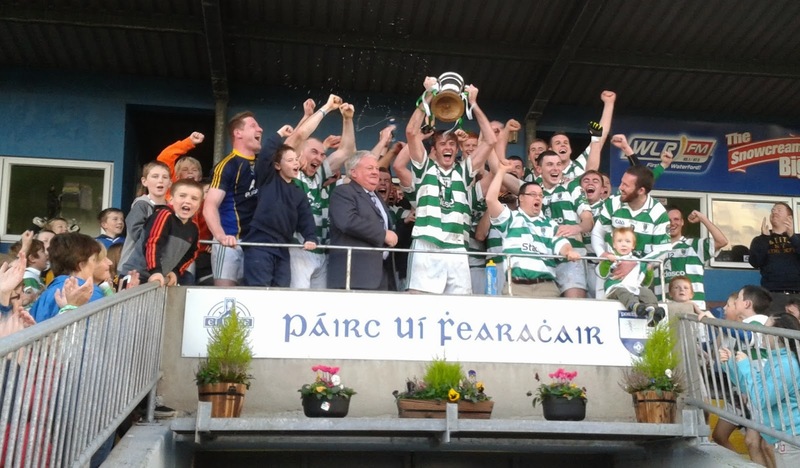 Last Sunday, Ballinacourty Senior Footballers won the County Senior Football Championship with a 0-12 to 0-5 victory over Stradbally. This week's 'Blast from the Past' is a song penned by the late Dom Enright to greet the club's first County Senior Football Championship win over Clashmore in 1978. So join me in the chorus. They’re fast and they’re game and they’re sporty. And the Cup’s out in Ballinacourty. And soon Clashmore’s cream turned sour. In their beards you’ll agree they look grand. They could easily jump over the strand. They’re led on by John O’Dwyer. And we’ll gather round the blazing bonfire. And the Championship Cup is now ours. Did anyone ever work so hard? So rise up the White and the Green. To Séamus Fitzgerald on the wing. 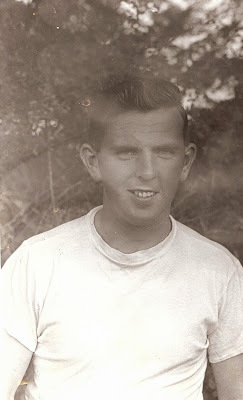 Our heart for the hurling still yearns. CLG Dún na Mainistreach / Baile na Cúirte would like to wish our Junior Hurlers the very best of luck in the County Junior Hurling Championship (Intermediate Attached) Final against Erin's Own at Walsh Park on Saturday. Throw-in is at 3:00pm. All support on the day would be greatly appreciated. Our popular Jack the Joker Fundraiser will continue this Sunday night in Kennedy’s Live where the Jackpot will be €5,450 as on Sunday night the Cosgrave Family, Tournore were drawn out of the drum and picked card 20 but did not find the Joker, yet he did win €50. Liam O’Brien and James, Jack and Joey won €25 each. 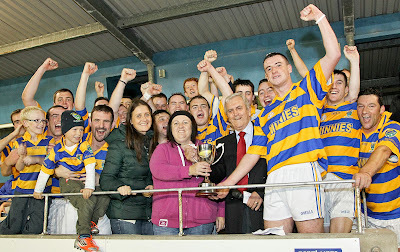 On Sunday afternoon last we defeated Stradbally in the County Final in Fraher Field on a score of 0-12 to 0-05. Throughout the game the team showed wonderful courage and commitment as well as playing some fantastic football to claim our third County Title in seven years. After the game Mark Fives accepted the Conway Cup on behalf of the team. In a fine speech Mark thanked all our club sponsors especially Jack O’Hare of Adesco. He also thanked our wonderful supporters before paying tribute to all our players for their commitment throughout the year, as well as complimenting Stradbally on their unique achievements over the last number of years. Mark also thanked all of the backroom team for their work during the year before finally mentioning our club members who passed away throughout the year. Afterwards the team enjoyed a meal in the Park Hotel in the company of many of our supporters who really got behind the team on Sunday. On Monday the team visited the schools of our parish where they received a wonderful welcome and we thank the staff of the schools for the welcome they gave us and for all the work they do in promoting our games in the schools. On Sunday next we play Limerick Champions Dromcollagahar Broadford in Fraher Field in the Munster Championship. Our Bingo continues this Sunday night in the CBS Hall where the jackpot is €1800. From all in CLG Dún na Mainistreach / Baile na Cúirte, a huge congratulations to our Senior Footballers on their fantastic 0-12 to 0-5 victory over Stradbally in today's County Senior Football Championship Final at Fraher Field. This is our sixth title adding to those won in 1978, 1979, 1981, 2007 and 2011. Well done also to team manager, Pakie Hurney and selectors Jim O'Mahony, Neil Moore, Jonathan Moore and Laurance Hurney and all the extended backroom team. This week's photo features Michael 'Fear' Organ who was a dedicated player, team mentor and administrator for many years with the club. Indeed, the Organ name has been synonymous with Abbeyside / Ballinacourty for generations and members of the extended Organ family continue to contribute to the club to this day. 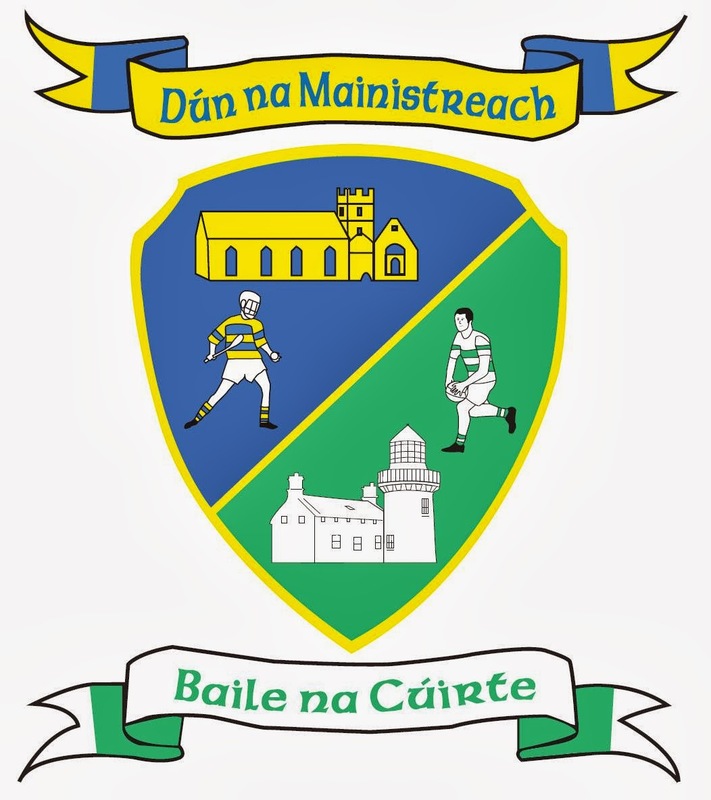 CLG Dún na Mainistreach / Baile na Cúirte would like to wish our Senior Footballers the very best of luck in the County Senior Football Championship Final against Stradbally in Fraher Field on Sunday. Throw-in is at 3:30pm. All support on the day would be greatly appreciated. Outdoor hurling continues every Saturday morning from 10.30 for boys aged five and up. Helmets and hurleys can be purchased through the club at a discounted price. All newcomers are welcome. We played our fifth game in the county under 16 football championship last weekend. After winning our previous 4 games we faced Gaultir who were also unbeaten going into this round of games. After a very tough encounter we came away with a victory in the end and thus have qualified for the knockout stages of this competition. Abbeyside was the host club for the final blitz of the season for U8 / U10 on Saturday morning last with Dungarvan, Ring and Clonea attending. A great morning was had by all with the girls putting in great work. There will be no training on Friday evenings for U8 and U10 as the evenings are closing in. The U12s will train in the wall ball on Saturdays at 11.30 am. Please remember to wear runners as there are no studs allowed. Click here to see photos of our County Senior Football Championship Semi Final victory over the Nire. Many thanks to Seán Byrne Photography for providing us with these pictures. 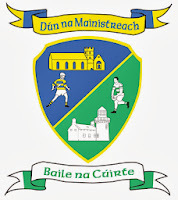 In preparation for Sunday's County Senior Football Championship Final, any member who can is asked to come along to Minnies on Tuesday night at 7:00pm to help put up flags and bunting around the village. Also, Ballinacourty car flags are available at €4 each or two for €7 and club hats can be purchased for €10. Contact Sharon Kiely for these items. 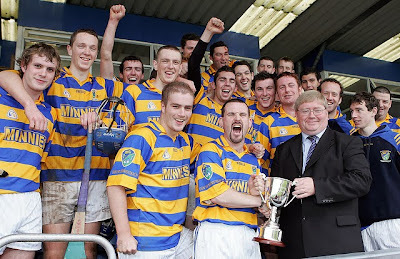 Back Row (L to R): Simon Hanrahan, Stephen Enright, Brendan Walsh, Eoin Enright, Dermot Melody, Stephen Lanigan, Ian Kiely, Pa Enright, James O'Mahony, Tiernan Murray, Jonathan Moore, Seán O'Hare, Alan Tobin, Declan Enright, John O'Driscoll, Seán 'Hiker' McGrath. Front Row (L to R): Rick Hanrahan, Paul Breen (Capt. ), Pat Grant (County Board Vice Chairman). This week's photo comes from 2007 and shows the Abbeyside Junior Hurling team celebrating victory over Ballygunner in the County Final. A tight encounter ended with a 2-10 to 1-10 win over the city side. This was the first year of the new style Junior Hurling Attached Championship. Our popular Jack the Joker Fundraiser will continue this Sunday night in Kennedy’s Live where the Jackpot will be €4,956 as on Sunday night Sean Óg Mansfield was drawn out of the drum and picked card 10 but did not find the Joker, yet he did win €50. Monica Dwane and John Power won €25. We were defeated by a very strong Dungarvan side on Saturday afternoon last in the semi final of the Western Championship. TEAM: L. POWER, P. COLLINS, B. LOOBY, E. BERGIN, L. BERESFORD, C. KINDREGAN, R. SHEEHAN, D. COLLINS, B. HENLEY, E. YOUNG, R. DUNFORD, S. FLYNN, S. O’CONNOR, S. DALY, M. MAHER. SUBS: J. DUGGAN, R. PROCTOR. We play The Nire this Saturday night at 7:30 in Fraher Field in the County Semi Final. On behalf of all in the Club we would like to congratulate Mark Ferncombe and Cassandra Dee on the birth of their baby son Callan last week. Our Bingo continues this Sunday night in the CBS Hall where the jackpot is €1700. On behalf of all in the club we would like to extend our sympathies to the family and friends of the late Jack O’Donoghue, Southways who passed away over the weekend. 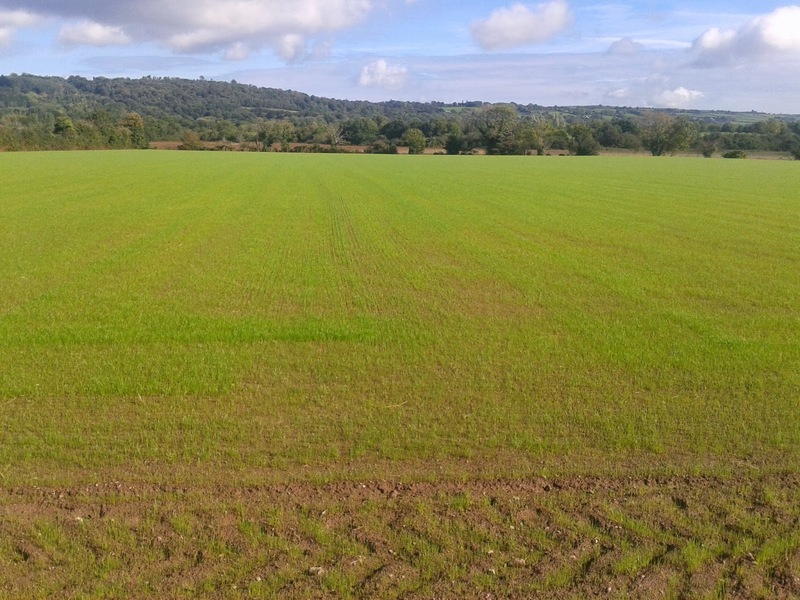 Here are some recent pictures to show how well the development of our new pitch is coming along. Our under 13’s completed the league part of the Western Football championship this week. We played An Ghaeltacht in Abbeyside on Wednesday evening. Our lads played well and played some good football and came out as winners. Our Final game was against Dungarvan on Saturday which they awarded to us. We now wait to know who we play in the Western Semi Final on the 19th October. Panel: Eoin Ahearne, Eoin Flynn, Meldan O’Dwyer, Cian Fagan, Sean Kent, Shane Kiely, Seanan Travers, Dean Beresford Dathi Brunnock, Jamie Walsh, Ben Flynn, Danny Reynolds, Cian O’Riordan, James Riordan, Michael Kiely, Barry Morrissey, Ethan Raher, Daniel Raher, Oisin Hallahan, Michael Troy, David Shields, Sean Roche, David Hayes. Everyone in the club would like to wish Meldan O’Dwyer well as he recovers presently from illness. Our under 12’s were also in action twice last week. 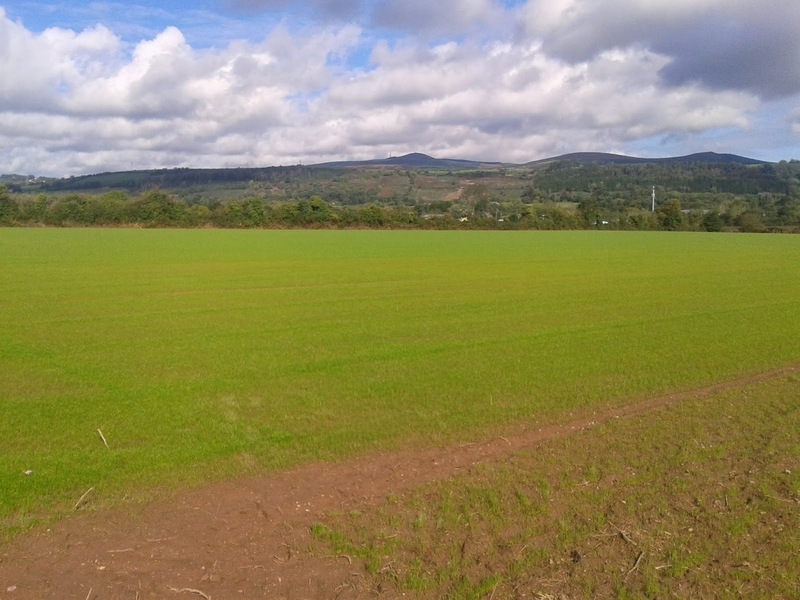 We travelled to Ring to play An Ghaeltacht and the Nire came to Abbey side. We played well in both games and came out on top in both. We have our last game in the league against St Olivers. Our under 16 footballers were also in action on Friday night in Abbeyside where they faced Tramore. This was another very good performance by this panel of players and they came away with a comprehensive win. Again everyone in the club would like to wish John Elsted well in his recovery from a blow to the head he took in a recent soccer match. Hopefully we will see him in action again in the not too distant future. 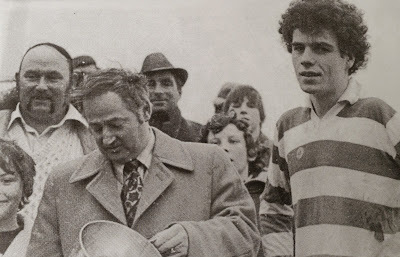 This week's photo brings us back to 1979 and the presentation of the U21 Western Football trophy by Divisional Board Chairman, John A. Murphy to Ballinacourty captain, Ger Looby following his side's 1-9 to 2-3 victory over Kilrossanty at Fraher Field. 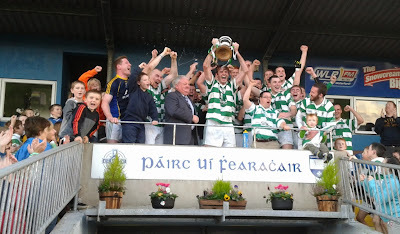 Six weeks later the County Title was added after a 2-8 to 2-4 win against Ferrybank at the same venue. Recently, the club executive committee decided to upgrade our crest in order to bring it up to a high standard. There had been clarity issues with the previous version on jerseys and club merchandise. Our new crest is identical to the old one, only that everything is much sharper. It still bears the images of Abbeyside Church and Ballinacourty Lighthouse, along with a hurler in blue and gold and a footballer in green and white. The banner scrolls on the top and bottom include the club's name as Gaeilge and are made out in the colours of Abbeyside and Ballinacourty. Many thanks to Printmaster for producing such a high quality design. Our popular Jack the Joker Fundraiser will continue this Sunday night in Kennedy’s Live where the Jackpot will be €4,704 as on Sunday night Rosie Cosgrave was drawn out of the drum and picked card 19 but did not find the Joker, yet she did win €50. Bernard Troy and Esther Young won €25 each. On Friday night last we recorded a wonderful victory over Brickey Rangers in the Western Final in Fraher Field. This was a game which we led for most of the game except for a short period before half time, but the team played with great spirit in the second half to ensure that they held on for a deserved win. After the game team captain Owen Young accepted the cup on behalf of the team and thanked all of the players and team management for their efforts all year. We will now play Erins Own in the County Final. TEAM: J.P. McGRATH, D. FERNCOMBE, P. BREEN, A. O’RAGHNAIGH, R. SHEEHAN, L. BERESFORD, C. ENRIGHT, B. WALSH, B. HENLY, O. YOUNG, R. RYAN, M. MAHER, K. KELLEHER, I. KIELY, S. FLYNN. SUBS: J. RYAN, S. BURNS, S. KIELY. We were defeated by Ballygunner on Sunday last in the Semi Final of the County Championship in Walsh Park. We would like to thank the players and team management for their commitment and dedication throughout the year. TEAM: S. ENRIGHT, J. POWER, S. O’HARE, S. O’DONOVAN, J. HURNEY, J. GORMAN, S. BRIGGS, D. COLLINS, R. FOLEY, M. FIVES, G. HURNEY, G. BREEN, M. GORMAN, P. HURNEY, M. FERNCOMBE. SUBS: M. O’HALLORAN, B. LOOBY, S. CROTTY. We play Dungarvan this Saturday afternoon in the Western Semi Final in Fraher Field at 2pm. Our Bingo continues this Sunday night in the CBS Hall where the jackpot is €1650. We would like to thank all those who supported our table quiz in Minnies on Saturday night last and also a big thank you to Bob O’Brien and his team. A great turnout was present on Saturday morning last for the Danny Lenihan Cup Day. Thanks to everyone who brought along their kids for this day and a great day was had by all. A big thanks must go to the team trainers etc for making this such a great day and making sure the event it run so smoothly. Our under 16 footballers played their third game in the football championship on Sunday morning last. After another good display the lads won this game comprehensively and now we are after winning three games from three in this league so far. Hopefully now we will qualify for the knockout stages.